Christmas and New Year noon is very soon! It is time to update your computer desktop with our new free Christmas screensaver. Christmas Symphony screensaver is very remarkable application that will make your desktop unique. Christmas and New Year noon is very soon! It is time to update your computer desktop with our new free Christmas screensaver. 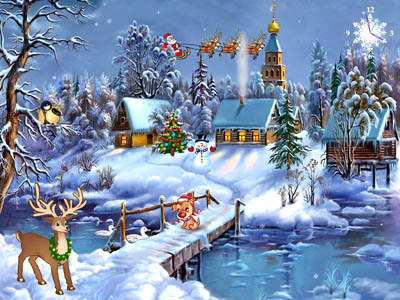 Christmas Symphony screensaver is very remarkable application that will make your desktop unique. Every scene of this screensaver consists of a lot of realistic and well animated Christmas characters and decorations: Santa, Snowman, dressed Christmas fir, snowflakes falling from the sky, and others! Feel the presence of the Spirit in the walls of this magnificent old church as you get to fly around the holy place as if you yourself acquired wings. There`s Light coming through the windows and the open doors. His kingdom is near!